The recent NASA satellite image shows that La Niña is peaking in intensity, increasing the odds that the southern and southwestern United States will remain dry as the Pacific Northwest has a stormy winter and spring. The image from NASA’s Jason-2 satellite is based on ten days of data and shows that Pacific sea surface height is higher than normal due to warmer water temperatures. La Niña, “the diva of drought,” is peaking, increasing the odds that the Pacific Northwest will have more stormy weather this winter and spring, while the southwestern and southern United States will be dry. Sea surface height data from NASA’s Jason-1 and -2 satellites show that the milder repeat of last year’s strong La Niña has recently intensified, as seen in the latest Jason-2 image of the Pacific Ocean. The image is based on the average of 10 days of data centered on Jan. 8, 2012. 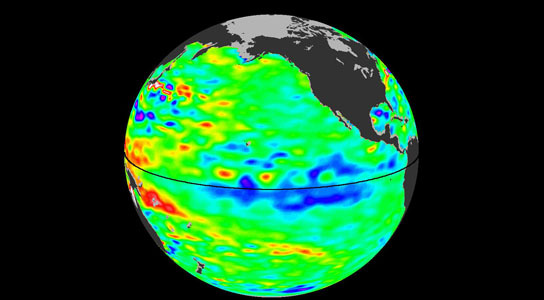 It depicts places where the Pacific sea surface height is higher than normal (due to warm water) as yellow and red, while places where the sea surface is lower than normal (due to cool water) are shown in blues and purples. Green indicates near-normal conditions. The height of the sea surface over a given area is an indicator of ocean temperature and other factors that influence climate. This is the second consecutive year that the Jason altimetric satellites have measured lower-than-normal sea surface heights in the equatorial Pacific and unusually high sea surface heights in the western Pacific. NASA will continue to monitor this latest La Niña to see whether it has reached its expected winter peak or continues to strengthen. A repeat of La Niña ocean conditions from one year to the next is not uncommon: repeating La Niñas occurred most recently in 1973-74-75, 1998-99-2000 and in 2007-08-09. Repeating La Niñas most often follow an El Niño episode and are essentially the opposite of El Niño conditions. During a La Niña episode, trade winds are stronger than normal, and the cold water that normally exists along the coast of South America extends to the central equatorial Pacific. La Niña episodes change global weather patterns and are associated with less moisture in the air over cooler ocean waters. This results in less rain along the coasts of North and South America and along the equator, and more rain in the far Western Pacific. The comings and goings of El Niño and La Niña are part of a long-term, evolving state of global climate, for which measurements of sea surface height are a key indicator. Jason-1 is a joint effort between NASA and the French Space Agency, Centre National d’Études Spatiales (CNES). Jason-2 is a joint effort between NASA, the National Oceanic and Atmospheric Administration, CNES and the European Organisation for the Exploitation of Meteorological Satellites (EUMETSAT). JPL manages the U.S. portion of both missions for NASA’s Science Mission Directorate, Washington, D.C.
Be the first to comment on "NASA Satellite Image Shows La Niña Peaking in Intensity"